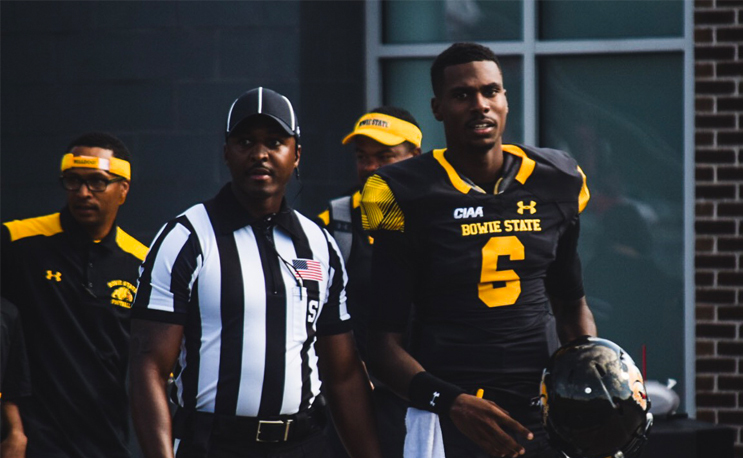 BOWIE, MD–Bowie State plays its final regular season home game this Saturday, November 3, against Elizabeth City State. This game will be a busy one. Outside of 23 seniors being honored before the game, the CIAA Northern Division crown alongside a spot in the CIAA Championship next weekend can be clinched with a victory. Senior quarterback Amir Hall, who will be honored before kickoff, has a couple of individual accolades on the horizon as well. He is within reach of breaking two CIAA records: total career passing touchdowns and total career passing yards. Kam Smith of Winston Salem State currently holds the career touchdown record with 96 and Earl “Air” Harvey of North Carolina Central currently holds the record for 10,621 yards through the air. Wishing him the best!! Wish I could be there. However, I'm hoping he has a GREAT game and throws for 423 yards lol. Through his career, Hall has totaled 10,198 passing yards and 94 passing touchdowns, averaging 318.7 yards-per-game through the air. After stepping up for one game his freshman year in 2015, his sophomore season in 2016 concluded with 3,596 passing yards and 30 touchdowns. The following year, Hall finished with 3,519 yards passing and increased to 41 touchdowns. Through his senior year, he is currently at 2,992 passing yards and 23 touchdowns. Hall needs 424 passing yards and three passing touchdowns to break the respective records. Though he has only had one game this season with over 400 yards through the air, Hall finished six of the nine games thus far with over 300 yards, with five of those six being less than 50 yards shy of 400. Hall has also three or more passing touchdowns in four games. It doesn’t all boil down to Saturday’s matchup; Bowie may make it to the championship game, but what better place to do it than at home in the regular-season finale?